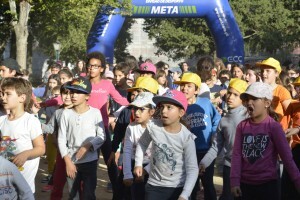 One of the local partners in Portugal, the Évora Municipality, organized a marathon and a march, in partnership with Globalsports, called – “Race and March Évora Monumental. On Friday the 20th November 2015, they organized an associated event for schools. All the schools that were then playing (or subscribed) for the Traffic Snake Game participated, and a total of 500 students (and their teachers) participated in these activities throughout the day. 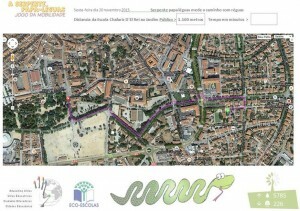 The Municipality as a local implementer of the Traffic Snake Game find it important to encourage sustainable mobility and healthy lifestyles, reducing pollution, the promotion and enjoyment of public space, promotion of better knowledge of the historic heritage of the city, and the promotion of road safety. 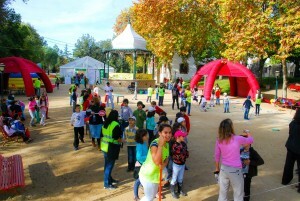 So, activities like this – inviting students and teachers to walk, to enjoy and better know urban and rural public spaces of the city -, and the availability of infrastructures that allow that to happen, are important means for the formation of the individual, for their physical, intellectual, and social development. 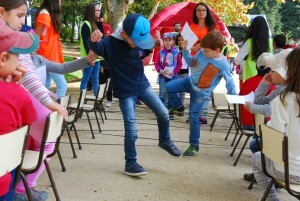 This activity in particular, held a public garden, was developed in partnership with teachers in order to properly address issues such as sustainable mobility, health / to healthy lifestyles, and environment. 1- In the classroom, children observed on the map the marked routes and the distance to be made by foot, from the school to the public garden. Maps with the routes for each school were developed. – Exploration of the local initiative (garden) – existing species of fauna and flora. 2 – Walk to the public garden. 3 – On-site pre-sports games, with recording the results, were performed, such as: launching the ball, long jump, high jump, jump rope, etc. The travel times for each route were registered. The organization provided healthy snacks (fruit) and water. 4- Return walk, back to schools.